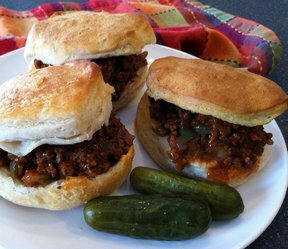 Take the "sloppy" out of Sloppy Joes by encasing the meat mixture in pizza dough. 1. Brown meat in large skillet on medium-high heat. Drain fat. Stir in Seasoning Mix and tomato puree. Set aside to cool. 2. Preheat oven to 375°F. Unroll pizza dough onto greased baking sheet. Cut dough into 4 squares. Sprinkle 1/4 cup cheese onto one-third of square lengthwise. Spoon beef mixture over cheese. (Do not spread to the edge). Top with pizza toppings. Fold side of dough over filling. Press around edges of pocket with a fork to seal. 3. Bake 20 to 25 minutes or until crust is golden brown. Make Ahead Tip: Cooked pockets can be wrapped tightly in foil and frozen. Reheat in preheated 350°F oven 20 minutes or until heated through.